Installed a Fine Offset Electronics WH1081 Weather Station on my roof the other day. Purchased the device from ebay for $85 and $25 delivered. The console is a touch screen LCD panel. Apart from the LCD being difficult to read due to being too light (needs a contrast setting) it works reasonably well. The best part about it is that it has a USB connection for plugging into a PC. To go with the USB conneciton the station comes with a software package called 'EasyWeather' which is functional and maintains a log with various graphs showing historical data. I wasn't too fussed on it though since it did things like give false readings and has really bad memory leaks. 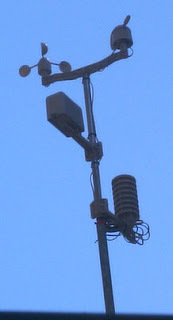 I tried Cumulus, which is another weather station application that can upload results to a FTP site for Internet access. However it doesn't recognise the WH1081 natively and instead relies upon EasyWeather to gather statistics - not good for the above reasons of instablity and memory leaks. Currently I am using the Linux console version of Weather Display. I like it because its a no fuss application with no frills and supports uploading results to Weather Underground natively. However it doesn't support 64bit at all, even when using IA32 libraries. This made me install 32bit Ubuntu (CLI only) within a VirtualBox - had to use the closed source version for the USB support. This is on my Mythbuntu 8.04 HTPC too, so the weather console sits on top of the TV in the loungeroom which worked out well. You can see my weather data on Weather Underground here. Now to find some time to get home and on the roof in daylight hours! My WH1081 arrived here yesterday and I am hoping for a long and happy association with it. I am also somewhat concerned as to the weatherproofness of the sensor unit, however, time will tell I guess. I notice that your unit is currently not active. I surely hope it wasn't affected by the outside weather transmitter. Oh and you may be interested to know that this unit will communicate directly with Cumulus by setting the station selection to "Fine Offset/Watson " in the version that I am now trialing. The only thing you need to look for is the temperature can be 1 - 3 degrees (C) off and you need to put some WD40 or something in the rain gauge to stop it the sensor from seizing.